How did Georg Takei get to be so cool? Tonight we got a robocall from Bill Bell reminding us to fill out our census form. Thanks Mr. Mayor, we already did! There's also a "so bad it's...bad" category of movies that I will never, ever see, but I still want to find out what happens. That's what TheMovieSpoiler.com is for. Another trip to the dump this morning. This time it only cost $1.06! I guess because of all those cut up trees. They're heavy, but we didn't cut off all the side branches, so they took up a lot of room. And so the overall load was lighter. After lunch Georg had the world music show, and I worked some more on weeding and digging up shrubs. The path up to the shed in the back yard had been planted with a row of forsythia. Which probably looked nice once upon a time. Not so much now. The forsythia are messy and overgrown, block the path in summer, and have volunteer shrubs (like evil privet) growing among them. I got to try out my new gardening accessories: I treated myself to a sun hat and a pair of knee pads. Which are fantastic! It's kind of amazing to kneel on the wet ground and not get all soggy, not have to worry about scraping my knee on roots or stones or whatever. I wish I'd had them while we were working on the bamboo. Really I wish I'd gotten them years ago. They weren't expensive; I don't know why I didn't think of it before. The hat was good too. Stays on my head comfortably, and has a nice big brim to keep the sun off my face & neck. I got it from Amazon & chose one in a light green. I wish it had air vents, but the light color will keep it from heating up too much in the summer sun. This afternoon I made really good progress; there's only one forsythia left. Unfortunately it's a big one, with a tree stump right in the middle of it. I think it's going to take the digging bar to get that one out. Which, after a couple of hours of digging them out with the shovel, I was absolutely not up for. So I called it a day and made dinner. I made one of my favorite cold weather recipes, in honor of a couple of cool days we've been having. It's a pork and white bean stew that's close enough to cassoulet that I feel mostly okay about calling it that, with the huge advantage that it only takes 3 1/2 hours. (Real cassoulet takes a couple of days, which is why I've never made it.) It's made with country style pork ribs, slow roasted and then added to a stew of wine and broth, with vegetables, bacon and bread crumbs. This time I replaced half the bacon with kielbasa, and added a little twist: Harris Teeter's meat department was selling little packs of trimmed lamb bones for only $1 a pound, so I got some for the cassoulet. Roasted them with the pork to bring out the flavor, then threw them in the stew. I think it added a nice little something. Maybe trying to jump straight from my quick, simplified cassoulet to the full-on Mastering the Art of French Cooking version is the wrong approach. Maybe I should gradually add more elements, make it a little more complex each time. This time it was lamb bones, maybe next time I'll spring for some duck confit. Or make it the day after running the smoker so I can add smoked sausages. The possibilities! The title of today's post comes from Eartha Kitt: "If you haven't any money, honey, go for the fat back." She went on to explain that when she first lived in Paris she had no money, so she ate lots of greens with fat back, which is high calorie and makes you feel full. Busy day today: took another load of wood to the dump, weeded, sawed small trees (previously felled) into lengths that fit in the truck, put them in the truck, planted seeds, weeded some more, cleaned the kitchen, and even did paying work. Whew! This was Jane's third trip to the dump, and this time she jumped right into the truck, no coaxing necessary. And then climbed right over to my seat! I wonder why she keeps doing that. 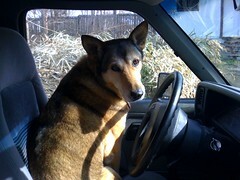 This time when I shooed her out of my seat, she crawled into the back of the cab and sat back there for the whole drive. Good thing it's a king cab with room for her to sit. It's probably comforting for her, to feel like she's hidden when we get to the dump with all the banging and heavy equipment. I'll have to clean up back there and put down a blanket for her. By far the hardest job today was cutting up the trees. Sawing with a hand saw, good lord that's hard work. My arms are sore now, I bet they'll be aching in the morning. There was one really big choke cherry that Georg had cut down last fall & was still lying where it fell. Getting it cut up and in the truck freed up a big space for planting. I have Benary's Giant zinnia seeds, maybe that's what I'll plant there. Almost all the indoor seedlings are up. The only things that didn't do well were the columbine (only 3 of 8 sprouted) and the datura (only 1 of 4) I'm more disappointed by the columbine because we don't really have room for more than one datura. It's a big plant and extremely toxic so it has to go outside the fence, away from Jane. She doesn't habitually chew on plants the way Lina used to, but we still like to be careful. The outdoor seedlings are doing well too. The sugar snaps, which were planted about a week ago, are starting to come up. The radishes look great, and the chard, spinach and cilantro are emerging too. Only the beets didn't do well. I planted 2 rows a couple of weeks ago, and only 3 seedlings came up. I replanted those rows and added a couple more rows. Hopefully we'll get some. I love beets. UPDATE: Turns out it's a fake account and the real John Boehner didn't say this at all. Okay, I should have checked that before posting. I did wonder why such an outrageous statement hadn't been reported in any of the blogs I read. Which is worse: if John Boehner is so racist that he intentionally said "the real Americans are the WHITES"? Or if he's so astoundingly stupid that he said that accidently. We got home from the radio station a little before 5 and have been watching C-SPAN ever since. Well, actually I admit that we've skipped over most of the "open debate period" this evening. It's not really debate, just each rep speaking for a minute or two. Just empty posturing. I left the debate on the TV while I baked cookies in the kitchen -- which I have to say, was the perfect way to watch it. I could vaguely hear them but didn't have to look at them or focus on what they were saying. Now we're watching the speeches with the sound off. It's interesting. The Republicans mostly look more defeated than angry or irate. I guess at this point they know the bill is going to pass. God I hope so. How do they choose the order in which people speak? Is it by seniority? It's mostly old people talking now. I hope that means they're getting near the end. Oh, Clyburn is speaking now. He's the one who got spit on by a teabagger yesterday. (Yes, a teabagger literally spit on him. He declined to press charges.) This one I'll watch with the sound on. It's the first day of spring! We celebrated by spending the day outside. In the morning we worked on Operation Destroy Bamboo, Phase 1B: we finished loading the truck with that rotten wood pile, which I had started on Thursday; took it to the dump; came back and filled the truck again. 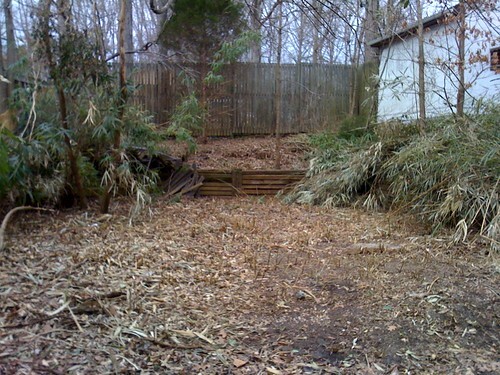 While we were working, Georg figured out where the wood came from: previous owners had had an aboveground pool in the area which became the bamboo patch. We know this because we found pool cleaning tools in the shed, and there's a large metal ring in the ground which must have been the foundation of the pool. The wood must have been used for either a frame or deck around the pool. When they moved out and removed the pool, they stacked up the wood and left it in the back of the yard. And we didn't care about the yard when we moved in, so we let it lay until now. I must say, moving a pile of wood that's been allowed to rot for over a decade is ... gross. It's really gross. Crumbling, turning to sawdust, full of creepy crawlies. The rusty nails in every board just add that je ne sais quois. We've been using the wheelbarrow to carry the wood to the truck, so we wouldn't have to touch the wood more than necessary. Good thing too, because in the bottom of the wheelbarrow we found a spider that we think was a brown recluse. (We looked at a photo online to identify it.) I had heard that brown recluses like rotten wood. Because I'm a sucker for living creatures, even horrible poisonous spiders, we didn't kill it. I went over to a corner of the yard and tipped the spider out. Maybe it will find a fallen tree in the empty lot to make a new home in. By the time we got the truck loaded again it was too late to go back to the dump, so we went out to lunch and then did more yard work in the afternoon. Georg cut down volunteer saplings in the bamboo patch, while I weeded out front and then dug up a forsythia by the shed. I want to plant hollyhocks in front of the shed so all the vines and scrubby shrubs have to go. It was positively hot out in the sun, so we took frequent breaks. During which I obsessively read Twitter updates on health care reform. I wish I could watch the vote on CSPAN tomorrow. Alas, I'll be on the air until 4, and then there's a mandatory DJ meeting. I'll just have to play lots of long songs so I have time to check Twitter constantly. On breaks I also checked the locations of various perennials, to see what's starting to come up. The brunnera Jack Frost is looking good. It's a beautiful foliage plant for shade, which needs moist soil, so I planted it right next to a rain barrel. All the hostas I planted last fall are starting to sprout! We got all big ones, mostly blue: Blue Angel, Krossa Regal, Sieboldiana Elegans, and Hollywood Lights. I never planted hostas before so I'm excited. Also very excited to see sprouts from the calanthe. It was a splurge last fall from Plants Delight, and when we checked out the guy said "Whoa, Orchids 202!" That made me a little nervous -- I do all right but I've lost more than my share of plants, and this one was expensive -- and it was such a wet winter, that I'm incredibly relieved to see the calanthe survived. We passed Orchids 202! Now we are both very tired. I'm so glad we had nice leftovers and didn't have to worry about cooking. On Monday Georg, S and I went to a Senate candidate forum sponsored by DFO (Durham for Obama). They invited all the Democratic candidates to attend and four showed up: Elaine Marshall, Ken Lewis, Cal Cunningham and Marcus Williams. Each candidate got to make a short speech, then they answered questions (all submitted in advance) and then closing speeches. It was fun to go to a DFO event again. I saw lots of people I knew, though most of them were volunteering so I only greeted a few. I felt kinda guilty that I hadn't volunteered! To be perfectly honest, I've been avoiding politics. I didn't know they needed volunteers because I haven't looked in my "politics" email box for weeks. I didn't even know about the event until S. asked us if we were going. Elaine Marshall: better than I expected. I went into it thinking she was a boring candidate, pragmatic and uninspiring. But she was lively and enthusiastic. Not perfect -- she had a good story about her youth which she told twice -- though I'll be comfortable with her if she wins the primary. Ken Lewis: was a somewhat flat speaker, didn't seem to wake up until the very end. He told a great story in the closing statement though, about his grandmother who had lived to be a hundred, and the changes that had occurred in America in her lifetime. It was the only genuinely moving moment of the entire evening, and if he had been like that all night I'd be firmly in his camp. On the other hand, he has no legislative experience. And he was the only candidate to slam the others (in his closing speech) which seemed like a sour note to me. Still, I'll be comfortable with him if he wins the primary. Cal Cunningham: I went there wanting to support Cunningham, wanting him to give me a reason. Unfortunately, he was a terrible speaker. He might be the most sincere, most earnest guy in the world in real life, but on the stage there was something completely phony, Mitt Romney-ish about him. When he told his big story in the closing statement -- it was about seeing his family for the first time after returning from duty in Iraq -- it sounded so contrived that all three of us rolled our eyes. Maybe it was just us, and the general public wouldn't be so put off by him. However, based on my impression I think he would be a disaster as a candidate. Marcus Williams: By far the best speaker, and clearly the least qualified. He connected with the audience every time he spoke. If only we could have a candidate with Marshall's experience and Williams' demeanor! At the end of the night we all voted for our preferred candidate. The idea was that DFO would endorse the winner, but as it turned out they set the bar too high -- 70% needed for an endorsement -- so they didn't endorse. Ken Lewis won the vote with a simple majority. *The first political comedy I ever saw was when Al Franken hosted nightly coverage of the 1992 conventions on Comedy Central. I think it must have been 1992 because I remember he did a hilarious parody of the video introducing Al Gore and his family. Anyway Franken had a panel there to talk about the speeches, and one of the panelists was Chris Rock. Every time someone said an empty platitude (which was constantly) Rock would shout "Babies should eat!" Ever since, when I watch a content-free political speech that's what I hear in my head. Chris Rock saying "Babies should eat!" over and over. Here's a photo of something besides bamboo! 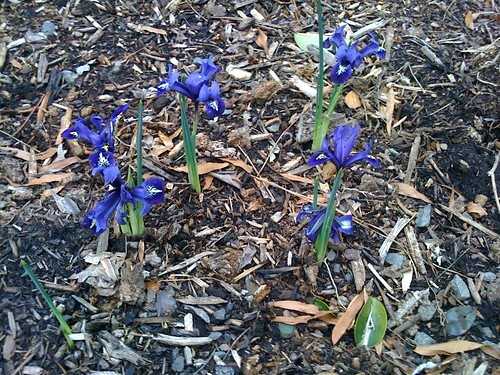 Last fall I planted these tiny "Pixie" irises by the back door. I had no idea what they were going to look like. They're cute! It's going to look great in a few years when they multiply. 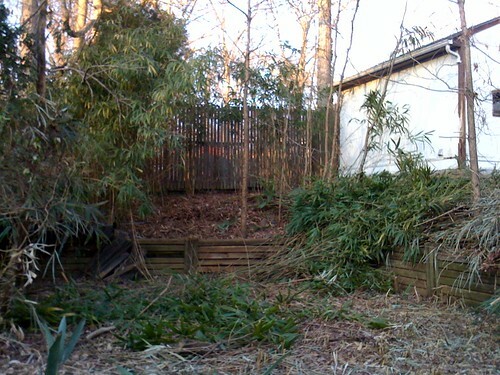 Okay, I did a little bit of Operation Destroy Bamboo today. I took the truckload of cut bamboo to the city dump. I took Jane with me, which was probably a mistake. She's a nervous dog, and the truck is a lot louder than my car, and then there was all kinds of heavy equipment at the dump. So she spent most of the trip clinging to me and/or shivering. Poor thing! I wonder if taking her with me again would help her get used to it, or would just scare her even more. 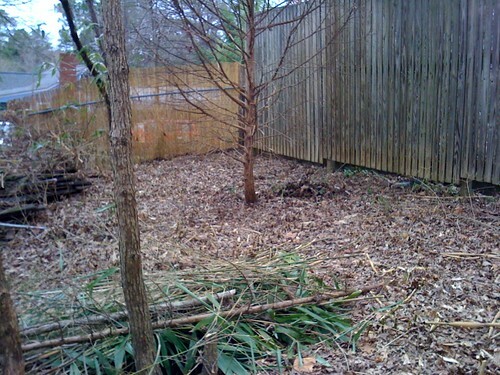 Phase 1 of Operation Destroy Bamboo is complete! !! !!! Well, almost. 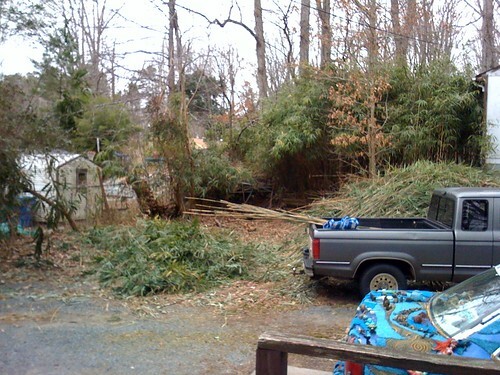 All the bamboo is cut down, except for there's a stack of old lumber on the left by the fence, which we think was there when we moved into the house (we can't find any photos old enough to confirm this), and a pile of yard waste on top of it which was ahem gifted to us anonymously. There are about a dozen stalks of bamboo growing out from under that. You can see in the above photo, on the right, that Georg started raking up the leaves & debris from the ground. We thought this would make Phase 2 (find and knock down shoots as soon as they emerge) easier. He said he saw lots of roots, no shoots. I'm sure an explosion of bamboo growth will start soon enough. 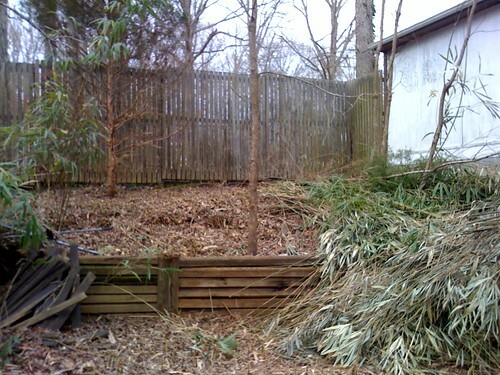 What I'm calling Phase 1B will be the removal of the pile of yard waste and lumber, cutting down the last bit of bamboo, and removing the mountain of cut bamboo which currently takes up almost as much space as it did when it was still standing. 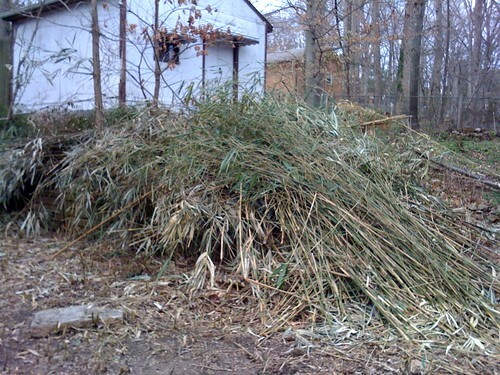 Phase 1B begins tomorrow, when I take a truckload of bamboo to the dump. Alas, the photos above show the mountain of cut bamboo after Georg filled the truck. It may be worthwhile to rent a big wood chipper and see how much of it we can grind up in a weekend. We have a small electric chipper which works well on sticks, but as I recall it can't handle bamboo leaves. If we had to trim every stalk and feed them into the chipper one by one, that would take forever. The neighbors put up a privacy fence yesterday, or at least most of one. I'm not sure if they plan to finish the fence or if they're going to leave that gap. That reed mat isn't ideal; I was thinking about planting climbing roses along that fence but I fear it would be too heavy and pull the reed mat down. Then again since it was no cost or effort to me I guess I can't complain. The upper level, up behind the parking area, is a revelation. It's been hidden by the bamboo for years. Shame about this tree. It has a nice shape but the bottom 2/3 of the branches are dead, and that kind of evergreen never grows back. I think it was a cypress. Georg has been cutting down the volunteer trees, which were mostly if not entirely dead already. I think we're going to leave the one in the foreground of the above photo, and put a birdhouse on it. It's the least we can do for the birds who lost all that greenery they used to hang out in. On the other hand, the hawks love this new clearing we've created. We've seen more hawks in the past two weeks -- sometimes so close you can almost count their feathers -- than in the previous two years. Happy hunting! I realized this was a bad head cold when I thought the casserole had tuna in it, and it was actually bacon. All those volunteer saplings will be cut down. They're mostly dead already, smothered by the bamboo. That wooden fence in the back is going to be in full sun. Maybe that's where we'll plant the Russelliana rambling rose. The soil up there is surprisingly good. I guess because leaves have been falling from the trees and just rotting where they lay for years. And the bamboo never got too thick because it was shaded by the thicker bamboo in front of it, in the parking area? Not sure. In any case, my hope is that we'll be able to plant up there, if not this year then maybe next year. We also spent some time cutting vines off the chain link fence (on the left in this photo) because our neighbors are going to put up a privacy fence. Just reed mat but it will get the job done. 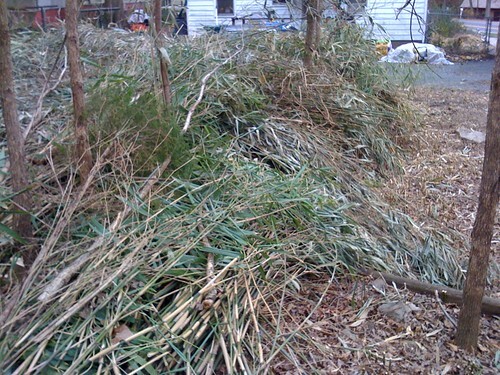 It turns out that while the bamboo was going crazy in our yard, they started cutting it back, last year I think. 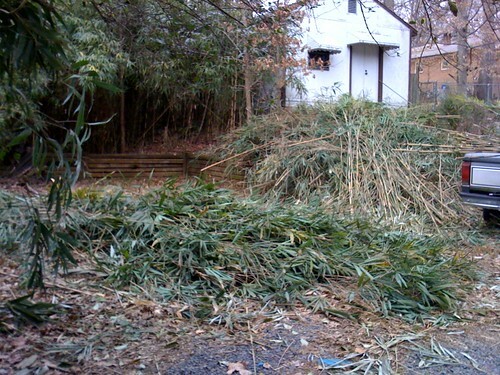 And they only have one spot near our yard that still has bamboo, which they worked on cutting down today. It was kind of weird for us all to be out there working at the same time. Had so much fun doing today's all Oscar winners radio show. It turned out to be more work than I was expecting, but so worth it. Most of the prep involved getting the movies from Netflix and ripping the songs -- or in some cases, discovering that the movie version of the song sounded awful, and then choosing another version. When I didn't go with the movie version I tried to play one that was as similar as possible (ideally recorded in the same year) so it would sound similar. The only one that was completely different was "Call Me Irresponsible." It was sung by Jackie Gleason in the movie, and he's supposed to be drunk, and it makes sense within the movie, but as a song it's not something you would want to listen to on purpose. So I played Bobby Darin's version. I did play a couple of songs that hadn't won: first, I started the show with two songs about Hollywood, "Hooray for Hollywood" and "Hollywood Party." Which I have to say, I've had "Hollywood Party" stuck in my head for days. It's a silly little song from a silly little movie, and fiendishly catchy. You can tell it's from a pre-code movie because it includes the line "Bring along your girl, go home with somebody else's; forget about your girl, she's going to do all right!" Besides that, I also played "Blues in the Night," which didn't win and probably should have, resulting in some controversy. And under the talksets I mostly played instrumental versions of songs that were nominated & didn't win. At the last minute, this morning I stumbled onto a CD of old movie commercials, which I had never gotten around to listening to and didn't even remember I owned. Popped it in the computer and it turns out they weren't short commercials, they were 15 minute promotional radio programs about the movies. And there was one for The Gay Divorcee, the source of the first winner, "The Continental." And it took me about 5 minutes to make a one-minute clip that I used to introduce "The Continental." It was great! It actually included the line "The Gay Divorcee is surely the gayest picture ever to grace the screen." Best of all, the show had been one minute short, I was thinking I was just going to have to pad it with a couple of extra long talksets or something. And so this fabulous little clip finished off the show perfectly. It was like the cherry on top. I guess it's for a few reasons: first of all, Oscar winning songs are all new, and it's hard to tell in the moment which songs are going to hold up in future years. Well, I think professional songwriters are probably better at judging that, but the entire Academy votes on Best Song. Also, the Academy has its own reasons for rewarding a song, which don't always line up with what I would consider the best song in a year. It is puzzling sometimes though, how they made the choice. For instance, the very first Best Song, "The Continental." The same movie included "Night and Day," which in my opinion is clearly the far better song, and wasn't even nominated. How did they decide which song was worthy of recognition? I have no idea. Or another example, the year that "Love is a Many Splendored Thing" won, the nominees included "Something's Gotta Give,"Love Is the Tender Trap" and "Unchained Melody." Looking back their choice seems almost perverse. I'm sure it seemed like a good idea at the time. 1. We're about to hear a song from a movie, which begins with the fanfare played under the studio logo. Listen to the fanfare and name the studio. 2. The singer who performs an Oscar-winning song in the movie doesn't share in the award, even though a memorable performance can have a lot to do with the song winning. What singer gave the most performances that resulted in a Best Original Song win? 3. At first the award was called "Best Song" and the only rule was that it appeared in a movie in the previous year. "Sweet Leilani" (which I had just played before asking this question) was a radio hit for Bing Crosby in 1935, and then they put it in a movie two years later and it won the Oscar. Now the award is called Best Original Song & the song must be written specifically for the movie. Why was the rule changed? 4. Who is the only Oscar to win an Oscar? 5. What happens to an Oscar statuette when its winner dies? 6. Last year "Jai Ho" from Slumdog Millionaire won best song. That was only the 3rd time the Best Song was not in English. What was the first? 7. For decades there was no rule, but by tradition only one song was nominated per movie. What as the first movie to get more than 1 Best Song nomination? 8. Who was the first woman to win Best Song? Either composer or lyricist. Continue reading that ever graced the screen. No progress today but here are a couple of photos I took this morning. First, the lower area is clear! The fence is still pretty messy from dried up vines and stuff growing in it. We're going to finish cutting the bamboo first and then go back to tidying jobs like that. 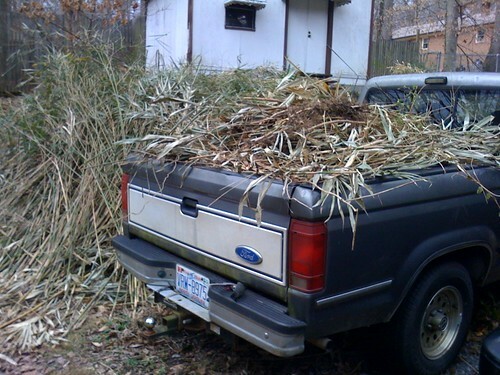 The pile of cut bamboo is on a slope, so I think it's an optical illusion that makes it look taller than the truck. I think it's an optical illusion. Anyone need cut bamboo? Anyone? No progress on Operation Destroy Bamboo today, because I was with clients all day and also it's freezing cold and raining. Instead, here's a little incident that really brightened up my morning. I was feeling so virtuous about having worked so hard yesterday, so I thought I'd get going early this morning and treat myself to breakfast at my favorite breakfast place, Nosh. We go there almost every weekend, so they know us, and I've gone in enough on weekdays that the weekday folks mostly recognize me too. I like to sit at the row of tables by the front window, so I can keep an eye on my car. Vandalism isn't a huge problem for me, but with an art car it's always a possibility. So when I park UMJ someplace with heavy foot traffic, I like to sit where I can see the car if possible. There was only one table free by the window, and while I walked to it, a guy at the next table said, "Anyone who would drive a car like that is crazy" just as I passed by his table. His friend knew it was me, and started making awkward "can it" gestures, like a nervous head shake, to which the first guy was like, "what? what???" Then I realized that I had forgotten to get my drink cup, so I got up again, and the friend actually pointed at me with his thumb as I passed them again. Smooth, gentlemen! I was so amused that I told the woman at the register about it, and she said I should go over and introduce myself. I think "At that point I would make my presence known" was the way she put it. I thought that was good advice so when I sat back down I said "Good morning! How's it going?" The first guy had his back turned and didn't respond. The friend looked monumentally uncomfortable, I think he literally cringed, and tried to acknowledge me without speaking or making eye contact. Doubly smooth! After that I ate my breakfast, read email on my phone, and ignored them until they left. The friend left first, then when the guy who called me crazy walked past I said "Have a good morning!" He smiled nervously and said thank you while hurrying past, like he thought I was going to attack him or something. You never know what crazy people will do! What a weasel. He said something stupid and rude about a stranger, and got caught. When I said good morning, it had to be obvious that I had heard him. If he had apologized and laughed it off that would have been totally cool. The funny thing is, I see that guy in Nosh all the time. He just didn't recognize me because when Georg and I go together we always take his car. I'm debating whether to greet him every time from now on, or let him alone. I was laughing about this all morning. If I can make a rude jerk uncomfortable just by smiling and being friendly, it's a great day. I think I mentioned over the weekend that I expected an explosion of bamboo growth after we started cutting back, and was surprised not to see it. Well, I can stop being surprised. I was working on the bamboo today, and a few times I brushed the dried leaves away to look at the ground. And several times (not everywhere, but several times) I saw little bamboo shoots, lots of them, just starting to poke out of the ground. I don't know if it's because of the cutting, or because it's just the time of year for it to come out of dormancy. Whichever, here it comes! We had decided a few days ago that we'd wait until the parking area was clear, and then rake up all the leaves so we can watch for new shoots. Which is good timing, because I just about finished the parking area today! I found this foam block used for yoga, and used it to kneel/sit on while working on the bamboo. What a godsend. The bamboo was so thick where I was working today that I wouldn't have been able to kneel on the ground like I had done over the weekend. Besides growing really thick, the other annoying thing about the bamboo by the fence is that it got all tangled up in vines and tree branches. So when I cut a stalk, instead of falling over the cut end would bounce up into the air & it would just hang there. So I had to stop every few minutes and yank everything I'd cut out of the tangle. While I was working, I had this horrible vision of falling and impaling myself a dozen times on the punji sticks. Yes, I'm a worrier! It's a good thing I don't have kids because I'd make them live in a plastic bubble. I didn't stop working, but I did get my phone and kept it in my pocket. I figured if I stabbed myself on the bamboo, at least I'd be able to call 911. There's still a massive pile of cut bamboo and debris to be cleaned up, so I didn't take any photos today. It looks like a hot mess & I thought photos would just bum me out. We talked about it and I think we're not going to try to chip all the bamboo. There's just too much of it. We'll start taking it to the dump next weekend. It's really weird to have the chain link fence between our yard and our neighbors suddenly exposed. 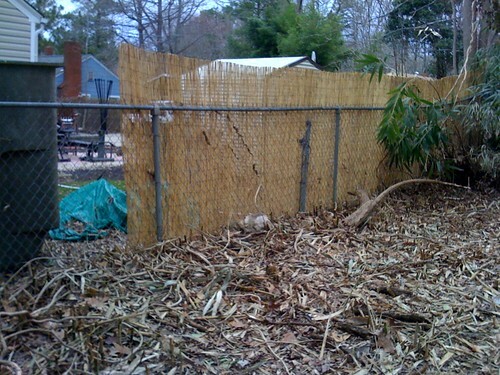 I hated that bamboo but it did an excellent job of creating privacy. I'd love to plant rambling roses along the fence. I've been wanting a place to plant Russelliana, a dark purple rambler. Of course it will be a long time before we can plant anything in that ground. In the meantime maybe I'll get containers and plant an annual like morning glories, which will grow fast and give us some privacy, and then go away at the end of the year. The silver lining to the sudden lack of privacy between us and our neighbors is that Jane finally noticed the dog next door. He's been mooning over her for years, while she's never even known he's alive. Well today she saw him! They had a nice little tail wagging nose nuzzling moment. When we started, it seemed like half the bamboo was in the parking area and half was up above. Now that the parking area is clear, we can see that the area above is much smaller. Georg said he thinks we're 2/3 to 3/4 done. Woo!